TAMPA, FL – A Tampa Bay Times editorial condemns Trump’s decision to terminate Temporary Protected Status (TPS) for 50,000 Haitians living in the United States, including over 32,000 living in Florida. The Department of Homeland Security announced last week it is revoking the Temporary Protected Status granted to thousands of Haitians who have been living legally in the United States after an earthquake heavily damaged Haiti in 2010. They will be able to stay in this country until mid 2019, when they will have to return to Haiti or risk being deported or detained. The tiny silver lining is that the administration has provided some 18 months for Congress to pass legislation allowing them to stay and creating a path to permanent residency. There is no valid public policy or national security reason for forcing out Florida Haitians such as Lys Isma, a Florida International University biology student who has lived in this state since she was nine months old. And what will happen to nearly 30,000 children of Haitians who were born in the United States and are American citizens? Their families will have to choose whether to leave them behind in the only country they have ever known or take them to a broken Caribbean nation that is foreign to them. The Department of Homeland Security justifies terminating the Temporary Protected Status of Haitians by claiming conditions have significantly improved in Haiti since the 2010 earthquake and the ever-struggling country can accommodate the influx of the thousands who fled to the United States. Baloney. As Jacqueline Charles of the Miami Herald told National Public Radio last week, little of Haiti has been rebuilt. Many buildings in Port-au-Prince, Haiti’s capital, remain uncompleted, the nation is financially broke and unemployment is staggering. There isn’t enough housing, teachers often aren’t paid and the World Bank reports about 60 percent of Haitians live on $2.41 or less a day. 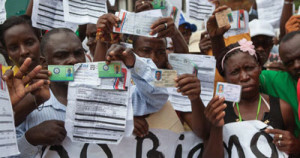 None of that sounds promising for Haitians who have been living legally in the United States, attending school, opening businesses and driving with valid licenses. The Trump administration’s cruel treatment of Haitians reflects an incoherent immigration policy under a president who campaigned on building a wall along the Mexican border and who preyed on the economic fears of Americans frustrated about losing their jobs to immigrants and seeing factories move overseas. There are some 300,000 holders of Temporary Protected Status in the United States from about a dozen countries, including Honduras and El Salvador as well as Haiti. What will happen to those from other countries besides Haiti? The so-called Dreamers, undocumented children who came to this country as children and have been law-abiding, productive members of their communities, remain in limbo. And comprehensive immigration reform that would address the 11 million undocumented immigrants is off the radar in Washington. There is no justification for forcing thousands of Haitians to abandon their lives in Florida and return to a broken nation that is clearly unable to accommodate them. The Trump administration has given Congress time to fix this, and Florida’s delegation should pay a leading role in ensuring that happens.